Te Ara Ahi Cycle Trail: There wouldn't be too many places in the world where you get to bike amongst active geothermal fields. That's what makes this such a unique, fascinating activity. 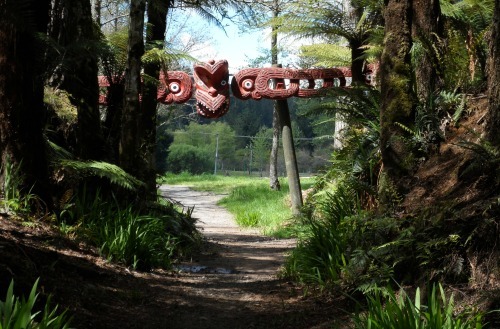 The full trail is about 51km (31.6mi) in length beginning at Rotorua's Government Gardens and finishing at Waikite Hot Pools. Some parts are family-friendly, others not so much. Luckily, the first few stages are flattish so you don't have to go too far out of the city to have a good time. Something else too, it would have to be one of the funnest, free things to do in Rotorua - if you have a bike that is. No bike? That's ok, hire one (see FAQ) or else walk some of the sections. 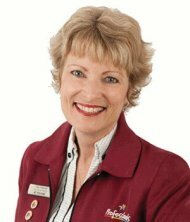 Do as much or as little as you like depending on time constraints… or energy levels. The great thing about Te Ara Ahi is if you want to do the whole cycle trail you get the opportunity to take in a number of our famous thermal attractions. 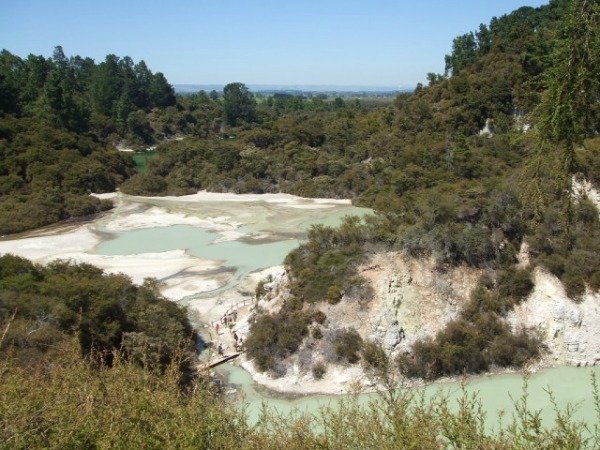 There's Whakarewarewa Living Thermal Village, Te Puia, Waimangu, Waiotapu and the Waikite Valley Thermal Pools. 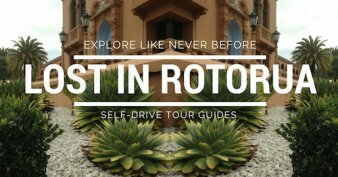 Of course you have to pay to go into these but there are some really good freebies along the way too like the Sulphur flats, Lake Okaro's wetlands, a thermal dip at Kerosene Creek or the more technical rides on Rainbow Mountain. 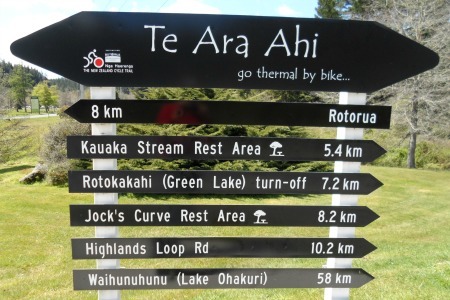 Te Ara Ahi, also known as Go Thermal By Bike, is part of the New Zealand Cycle Trail - Nga Haerenga. It's an evolving network of trails spanning the length and width of the country. 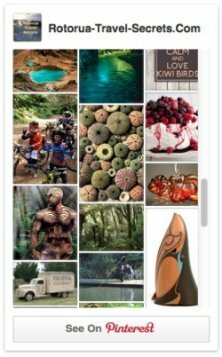 Delve into the Nga Haerenga website and you will see why the trails are fast gaining an international reputation. What a fabulous way to see a country. I'll focus mostly on this part of the trail as the grade is easy and it's suitable for everyone. Te Ara Ahi cycle trail officially begins at the arches leading into the Government Gardens on Queens Drive. Look for the signs (pictured on the right) to follow. They're not very big and on light blue posts. Bike to the round-a-bout beside the museum, can't miss it, huge Elizabethan building. Turn right to go past the front of the museum and just follow the road past the Blue Baths which will be on your right then Polynesian Pools on your left where you will come to another round-a-bout. Continue through this and turn left at the end of the road where you will see a carpark on the lake edge at the rear of the Sudima Hotel. Bike to the far side of the carpark where you will see the next marker. This dip is where you will enter the track to Sulphur Flats. It's a lovely flat ride around the lake edge through Sulphur Flats and the ever present billowing steam and plopping mud pools. A dip under Te Ngae Rd bridge and it's on to following the Puarenga Stream on your left with Sala St on your right. Cross over the road entrances to SCION, then Whakarewarewa School. Once you get to the second SCION entrance, cross that road too for about 5m and you will see the next sign to turn left onto a dead-end street (Froude St). Bike along Froude St until you come to a crossroads with Holiday Inn on the corner. A left turn here takes you into Whakarewarewa's Living Thermal Village. Stop off there for a guided tour or a walk through on your own otherwise carry straight on through the crossroads. Turn left at the BP petrol station onto Fenton St which becomes SH5. 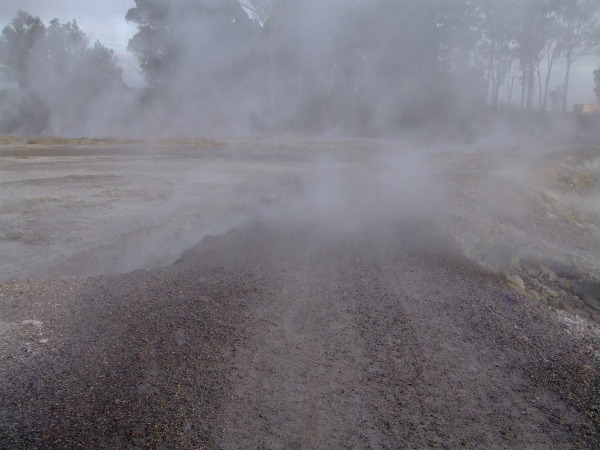 A cycle lane takes you to Te Puia, the next famous thermal attraction. If you're not planning on visiting there continue until you get to Te Puia's second carpark entrance. Go into this carpark and if you look to the far end, you will see the gateway carving that is the entrance to the Whakarewarewa valley section of the cycle trail. 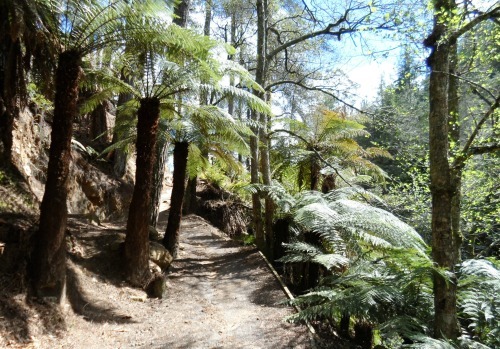 This section of Te Ara Ahi, known as the Hemo Gorge Trail, is only 1.5km long. That part of the track is fairly new. One day while out at the Waipa mountain bike car park, I was intrigued to see activity going on across the field and what would you know, not long after read about this section that was set to become part of the Te Ara Ahi cycle trail. That was enough, I was off to have a look. Gobsmacked is the only way to describe how I felt on seeing how lovely this area is. 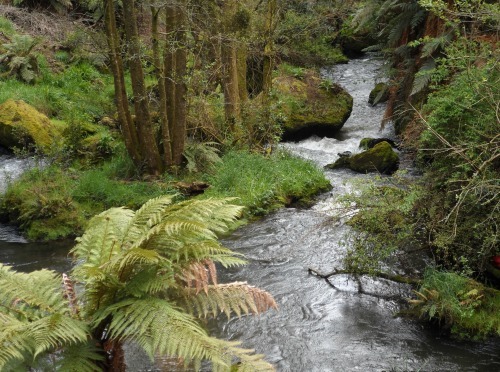 Puarenga Stream, the one you were following earlier, runs along the Whakarewarewa valley floor. Currents swirl around large lichen covered rocks and broken off pieces of land have become small islands. It's so pretty. I've driven and biked SH5 for years alongside this stream without being aware of its existence in this particular place. Unbelievable! It was totally hidden from view by scrub and the fact it's in a gorge below road level. What you don't know, you don't know huh? The mostly single file track has two-way traffic both foot and bike so care does need to be taken. From the carving at the entrance it's a swoop down into the valley then little ups and downs with periodic splits for walks and bikes. I could be wrong but it looks as though there is still work to be done with some scrubby bits that need clearing. Sometimes you can hear the tantalising sound of running water but can't quite see it because of the scrub. Further along are some really nice viewing spots and you can get right down beside the stream in places. Seating is available too if you want to stop for a breather or a picnic overlooking it. In time to come there could be quite a few spots to rest and relax in addition to the one's already there - actually, I can envision it being quite park-like which would be wonderful. 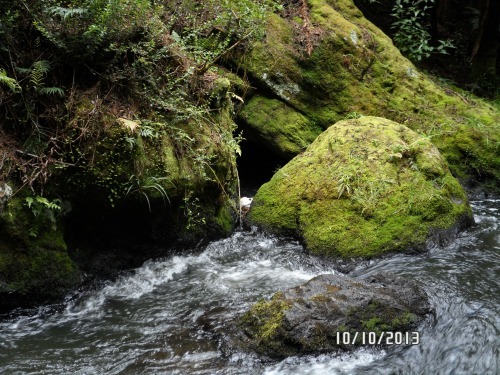 Once you arrive at the waharoa (gateway) above, that's the end of the Hemo Gorge section. Follow the path until you cross over the bridge pictured below to where the track splits. Ahead you can see the mountain bike carpark. Grab yourself a coffee, cold drink and something to eat here. Coming off the bridge, take the track veering left to access this (or bike straight across the field). You can choose to end your Te Ara Ahi journey here if you like and make your way back into the city. Catch a shuttle or backtrack to SH5/Fenton St and follow it all the way back into the city. If you have enough energy or feel adventurous you could also bike back via forestry roads. At the forest end of the carpark there's a forest road that's easy enough to see. Cross over the bridge you will see and when you get to the T intersection, turn right. This is Pohaturoa Rd. Meander along this, could probably take you 5 or so minutes, until you get to Nursery Rd. In case you are worried, you will find that this route is quite well sign-posted and there are also big maps of all the trails at various points. Any concerns, stop, sit down and wait for someone to come along to ask for help or, backtrack. If you want to continue biking Te Ara Ahi and don't want refreshments take the right turn coming off the bridge. 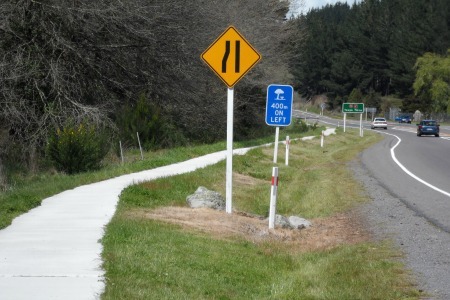 Cross Waipa Rd, veering right again, and bike to SH5 (50m) where you will see the distance signs pictured below. And the road stretching away into the distance like this. Only 40km left to go. That concrete pathway you can see running alongside the highway is the cycle trail. Once again it means two way traffic. There's no worries about crowds, in fact you may not see a single person biking. To check it out, I cycled out for an hour and the path just went on and on and on. It seemed to take forever. A girlfriend used this same path for her marathon training. Out and back she ran, day after day in the heat. That would have driven me insane because it was bad enough biking. Back to the topic at hand. 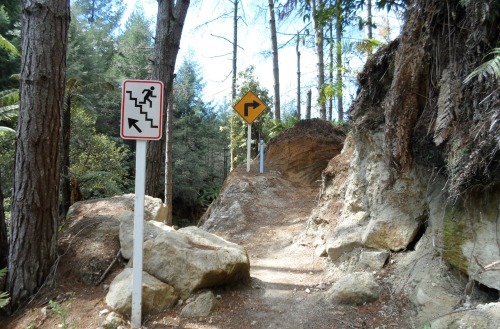 The first point of interest along here is Waimangu Rd which takes you to Waimangu Volcanic Valley and Lake Okaro. This little lake takes you through newly developed wetlands that shelter all sorts of water birds and it's a popular place for fishing and water skiing apparently. I haven't been there myself. Once you get to the turnoff to SH38, you will have to cross the road so be careful. Traffic belts along at 100km. 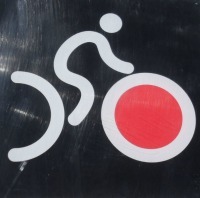 The cycle trail shortly arrives at Rainbow Mountain scenic reserve bounded on two sides by SH5 and SH38. As the name implies, volcanic activity has shaped this area with the ground peppered in colour. Te Ara Ahi skirts Rainbow Mountain but if you're an advanced mountain biker you may want to check out the track to the summit. Otherwise, continue along the cycle trail which can get steeper and will take you through to Kerosene Creek. Have a well-earned relax with a free thermal soak out in the open before heading back to Rotorua. For those who carry on, the Waiotapu Mudpools can be viewed 1km down Waiotapu Loop Rd, ride another 1km to get to Waiotapu Thermal Wonderland, and a short distance on from that again (same road) are the Hot 'n' Cold streams. Back out on SH5 and looking across the road you will see the Waiotapu Tavern. Look for an underpass to cross the highway. Next door to it is the Benny Bee complex, the store and service center for Arataki Honey. You've got to try their super delicious range of honeys and also consider purchasing a gift or two. Benny Bee also provides a general store, cafe and petrol station services. 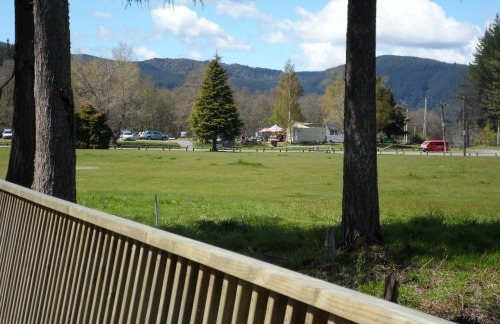 From Waiotapu, make your way to Waikite Valley Rd which is next to the Waiotapu Tavern. From now on it is rolling countryside and rural roads, wonderful huh? 6km will have you at the Waikite Valley Thermal Pools. Popular with locals, this complex has a number of pools to choose from including one to splash and have fun in. A campground is also available here if you decide you would like to stay another night. I guess one day over summer I'm going to have to get out and ride this whole section myself if only to let you know what you're in for. I know of at least one nasty hill on Waikite Valley Rd (returning) so there may be more for all we know. 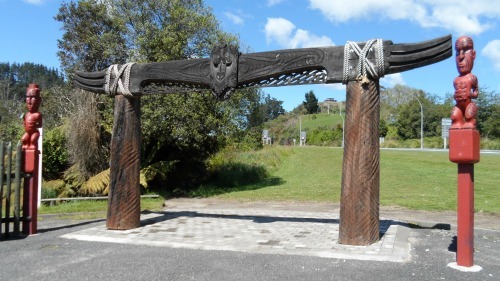 In all the lead up to the opening of the Te Ara Ahi cycle trail, the endpoint was said to be at Orakei Korako (74km). Then it changed and reduced down to 66km ending at a different part by Lake Ohakuri. Now, as at Jan 2015, it's down to 51km, or thereabouts. Stay tuned, it could change again. Where can I hire a bike for Te Ara Ahi? Mountain Bike Rotorua, located at the Waipa carpark have bikes you can hire for 1, 2 and 3 days. Can I get a ride back to Rotorua? If you don't want to bike back to Rotorua, Thermal Land Shuttle offers a daily cycle trail shuttle with drop-off and pickup points along the cycle route all the way to Waiotapu. They may also do pickups from Waikite Hot Pools (not confirmed).